The 31-year old Cain was originally drafted by the Brewers in 2004. He made his big league debut with the Brew Crew in 2010. However, the following offseason he was traded to the Kansas City Royals in a blockbuster trade that sent Zack Greinke to Milwaukee. Cain eventually emerged as a regular in Kansas City’s outfield. 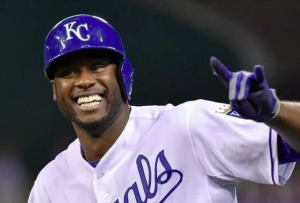 He had his best season in 2015 while helping the Royals win the World Series. Cain hit the free agent market after hitting .300 and posting an OPS of .803 in 2017. He’s also considered a plus defensive player. Outside of J.D. Martinez, who remains available, Cain was by far the second-best outfielder on the free agent market this winter. Despite a slow market for free agents this offseason, Cain got the money and years most predicted he would get when the offseason began. With both Yelich and Cain coming to Milwaukee, the Brewers have quickly overhauled their entire outfield. Despite being on the wrong side of 30, Cain still has the speed to be one of the better defensive outfielders in baseball. With that in mind, the Brewers plan on having him in center field with Yelich playing a corner spot despite playing center field for the Marlins last year. Despite a slight dip in his production last year, Ryan Braun figures to be the team’s primary left fielder. Of course, with Yelich and Cain in the mix, the Brewers are suddenly flush with outfielders. Domingo Santana could push for regular playing time after hitting 30 home runs during a breakout season last year. However, the Brewers have reportedly been entertaining trade offers for him. It’s possible he ends up being traded rather than fighting with Braun for playing time. Meanwhile, Keon Broxton is now in line to be Milwaukee’s fourth outfielder. Broxton started to establish himself the second half of 2016. But he struggled to find consistency in 2017, which implored the Brewers to seek an upgrade in their outfield this offseason. Milwaukee also has Hernan Perez and prospect Brett Phillips providing even more outfield depth. Milwaukee’s additions of both Yelich and Cain have a chance to change the landscape in the NL Central. The Brewers challenged the Cubs for much of last season and were just one game out of a wild-card spot. On paper, they look like a serious playoff contender, especially if they can trade one of their excess outfielders for rotation help. In the long run, it’s fair to wonder how Cain will hold up over his five-year contract. He’s already 31, and players who rely on their speed can sometimes struggle to remain impact players later in their career. However, Cain does make the Brewers better in the short-term. With the Brewers adding both Cain and Yelich in quick succession, they are a team to watch closely in 2018.